Living in Beaujolais for the past few months has revealed myriad semi-unknown regional charms. What it has not revealed are many good restaurants. The winemakers I know are kind of sho-ga-nai about the situation, aware that they themselves rarely patronise their rather dire local restaurants. Most villages have a bar and a restaurant, or one establishment serving as both, pitched at the lowest price range possible for the business to remain viable. 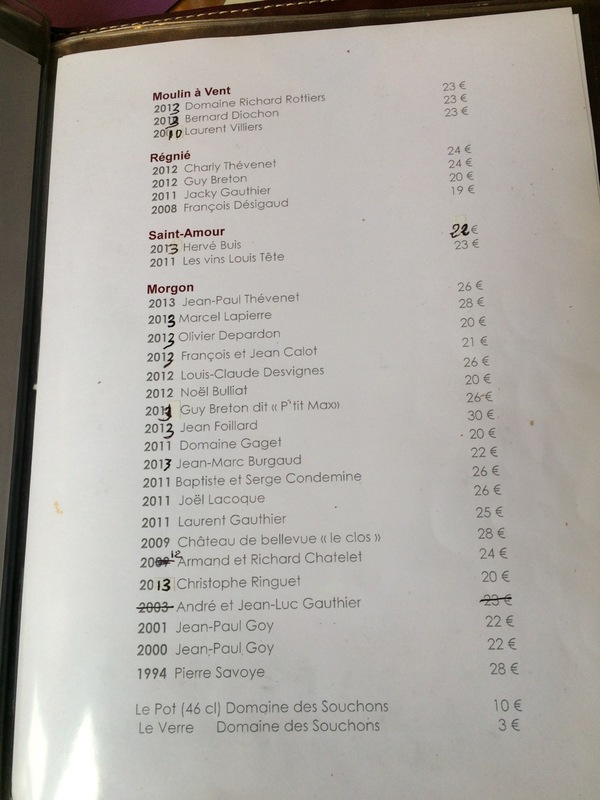 (In Beaujolais this is, strangely, still not that cheap. I often dine for the same prices in Paris' better-value restaurants.) 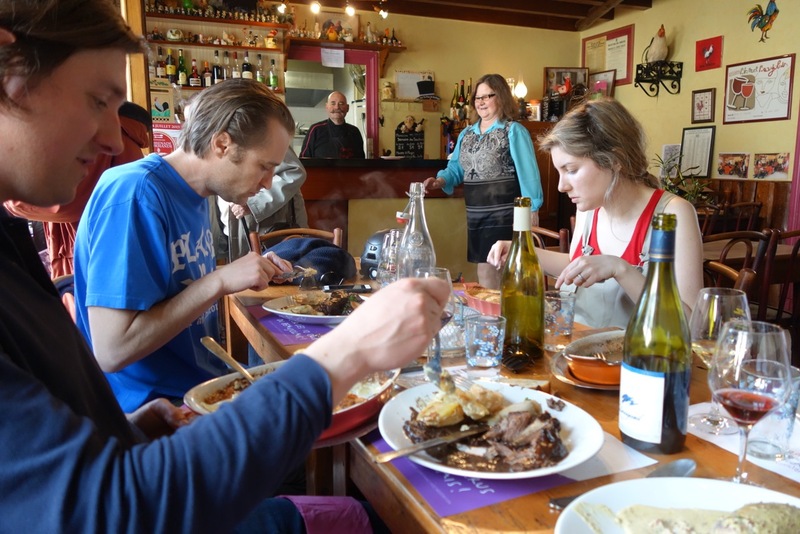 In some villages, there persist Michelin-style establishments, but they are perpetually empty-ish, seemingly dependent on the birthdays and anniversaries of the elderly, and on what trickle of Belgian and Dutch tourism still remains. Tourism overall has been in decline since the 1990's, and the corresponding stagnation in the average Beaujolais citizen's income, coupled with the eminent availability of large kitchens in private homes and the laudable persistence of culinary know-how among families, means that the natives simply don't dine out much. Atop the Col de Truges, however, on the border between high Morgon and Chiroubles, there sits a dowdy auberge whose unadorned Beaujolaise cuisine has remained constant, and consistently excellent, throughout the region's changing fortunes. Michèle and Jean-Jacques Soudeil took over the restaurant in 1980. The couple still comprise the principle staff members, with Michèle running the two dining rooms and the mustachioed Jean-Jacques occasionally peering, walrus-like, from the window of the kitchen. In the era of Marcel Lapierre's legendary mechoui parties, the Auberge was the site of the traditional morning-after meals. Photos of Lapierre and other winemakers adorn the walls of the lower dining room, while Domaine Marcel Lapierre's slender half-bottles serve as flower stands on each table. 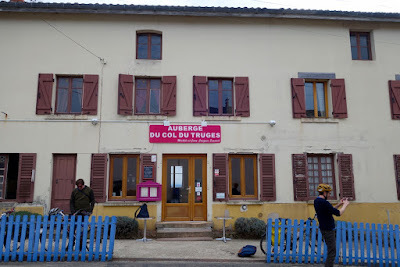 The extensive wine list attests to the Soudeil's long roots in the region, containing the current vintages of most of Lapierre's first-generation natural wine confrères, like Jean-Paul Thévenet, Jean Foillard, and Max Breton, along with back vintages of numerous lesser-known conventional producers. 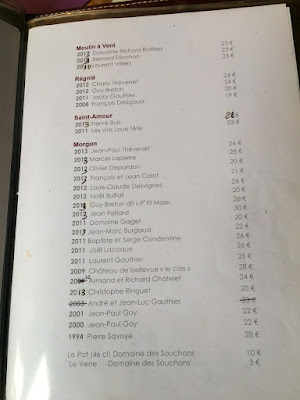 Were money no object I would plunder the list, just to experience these extinct generations of cru Beaujolais. 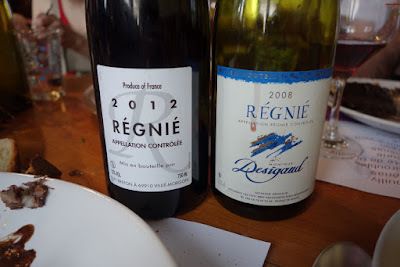 But experience has shown me that distant back vintages of unknown Beaujolais rarely compensate in education what they too often lack in pleasure. On my first visit to the Auberge my companions indulged my curiosity about a 2008 Régnié by Monique Désigaud. Michèle Soudeil informed that the winemaker, François Desigaud, was her brother-in-law, and had retired the year following the vintage. Vinification chez Desigaud was conventional, with select yeasts and zero qualms about sulfur use or chaptalisation. The wine was by no means dead. It's aromas spanned potpourri to tobacco and bonbon, and the palate was elegant until a sulfur-related dry-out on the finish. 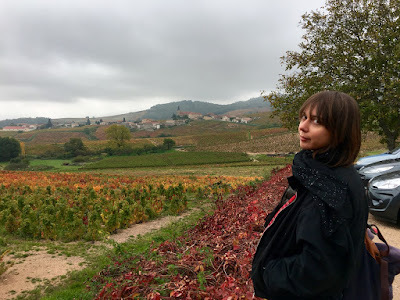 But the wine's dominant impression was that of the car-interior of a heavy-smoking grandmother, a stale profile I seem to encounter often in older conventional Beaujolais. We left it unfinished in favor of Régnié's reigning exemplar, that of Max Breton. The culinary reputation of the Auberge rests principally on Jean-Jacques Soudeuil's coq au vin, which one should certainly order on one's first visit. I'm told Soudeuil adheres to the classic, extremely time-consuming method of preparation, which involves stewing the coq at low temperatures for hours and hours. The resulting dish is pungently savoury, although depending on which bits of coq one receives the meat itself can be slightly dry at times. More consistent is Soudeil's marbré de lapin, a rabbit terrine so nuanced, filigreed, and ultimately refreshing that in summertime I'm tempted to ask for double portions. 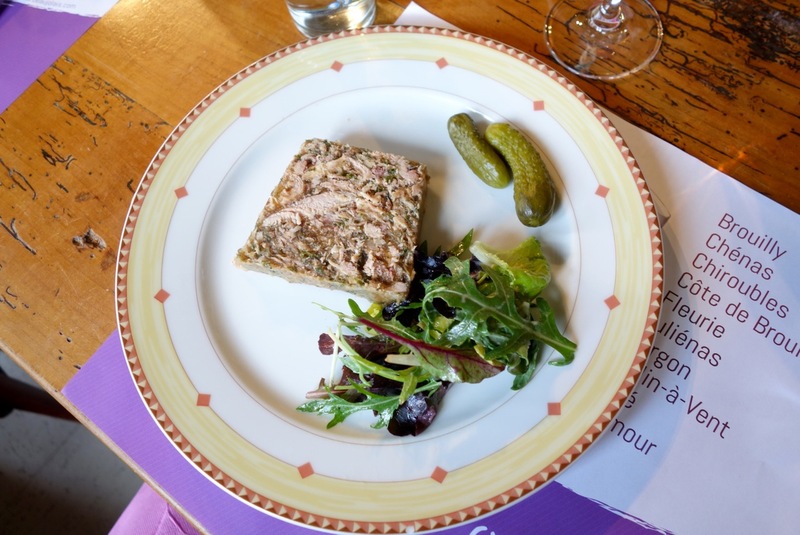 The restaurant's lone pescatarian main course is a bechamel-drenched, whale-sized quenelle of fine provenance, sourced from Pascal Bonhomme (of Lyon's Café-Restaurant du Soleil). 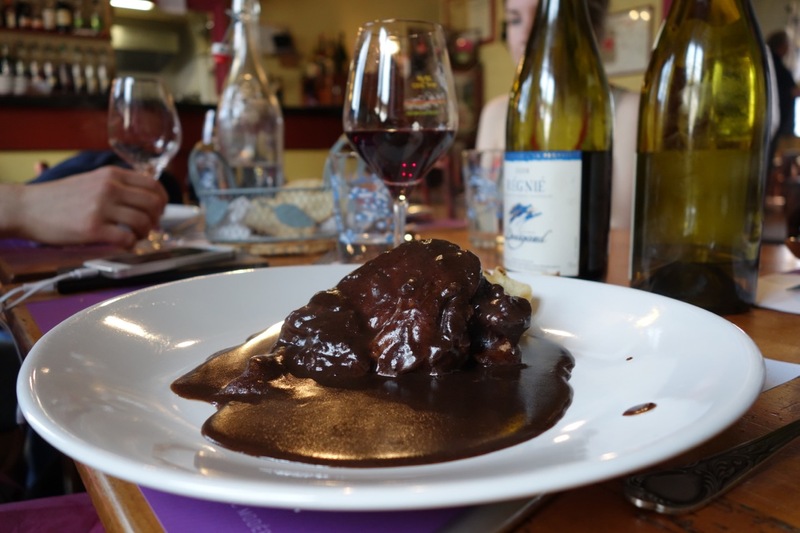 It seems noteworthy, vis-à-vis the aforementioned lack of good restaurants in Beaujolais, that Bonhomme also delivers quenelles directly to many of the region's more gourmand winemakers. The restaurant's practice of serving side dishes of gratin (and sometimes foraged mushrooms) in generous communal portions reinforces the cosy impression of dining chez quelqu'un. 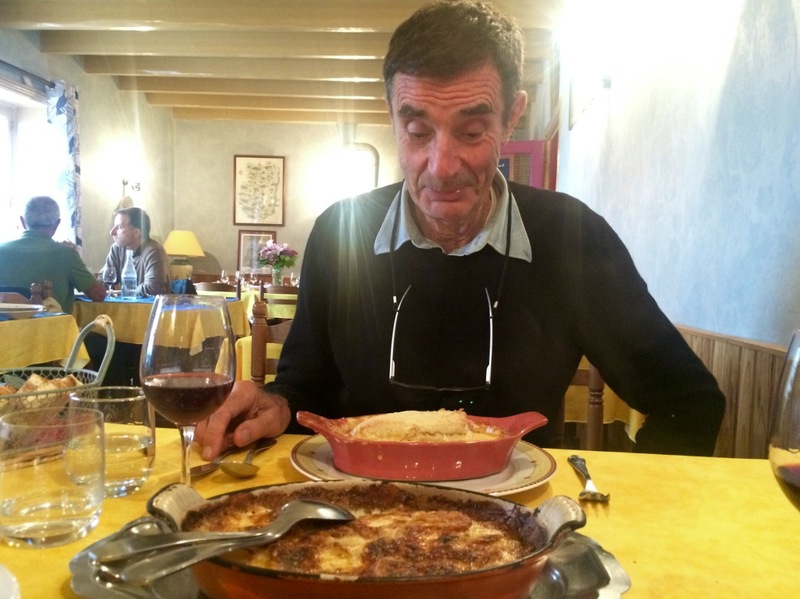 My dad surveys the enormous quenelle. 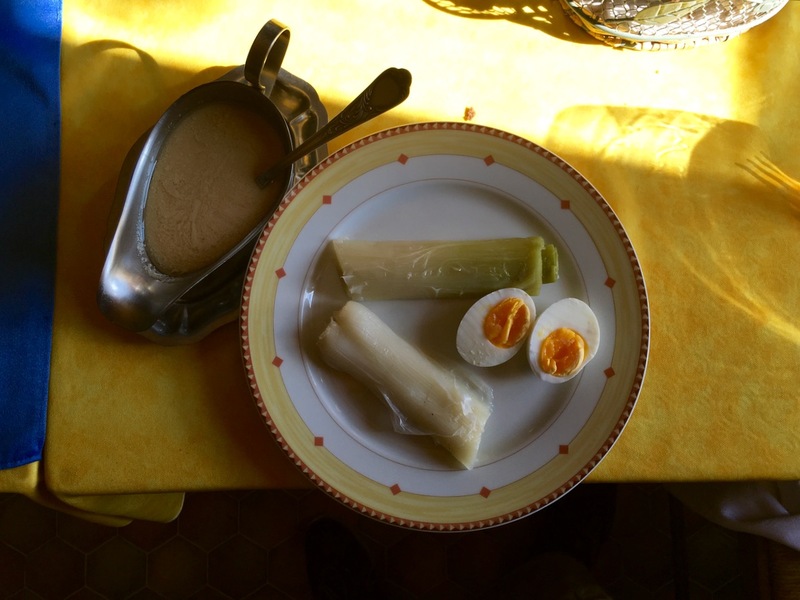 One might say that at L'Auberge du Col du Truges, one eats as well as one does in the region's most refined private homes. For Beaujolais, this is the highest praise possible. The lovely view from the parking lot of the Auberge du Col du Truges, with the village of Saint Joseph in background. Longtime blog readers may recognize the sarcastic grimace of the original Native Companion, who remains a good friend. 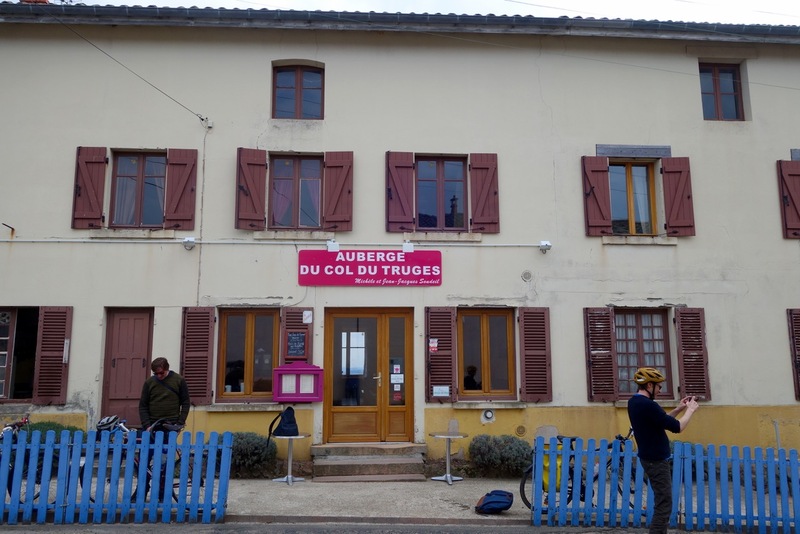 A 2008 write-up of L'Auberge du Col du Truges in L'Express. Hello, great site and details. We plan to go to Morgon and surroundings in March. Would suggest any places to eat? great! I am a native from Burgundy (Beaune) and moved to California 7 years ago to live with my American husband. I agree with all your comments. I go and visit Burgundy once or twice a year and find difficult to find good spots for good food and wine.